After 25 years, Martin Pirktl leaves the Eos Guitar Quartet in order to devote more time to his personal artistic endeavours. 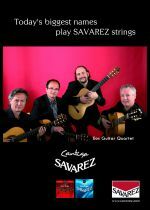 Julio Azcano is the new member of the quartet. To the next 25 years!